Elliptica is one of the new mattress collections introduced by Kingsdown at the 2015 Winter Market in Las Vegas. This collection is unique in having foam springs. Three innovative coils are used in Elliptica Collection mattresses: DNA Foam Coils, Qualatex™ Foam Coils, and Omalon® Foam Coils. Unlike the honeycomb configuration of the Octasprings made by Dormeo , these are more coil-like. Qualatex foam is used twice in Kingsdown's Elliptica mattresses, in the top two layers. Qualatex is a version of synthetic latex introduced in 2009 by Carpenter, a manufacturer of urethane. Latex, whether synthetic or natural, is resilient. 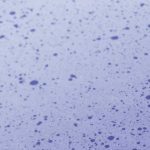 Synthetic latex has some advantages over the natural material. It is usually more durable and less expensive. The Qualatex™ Foam Coils (Q-Coils) are cylinders with hollow centers, more like thick-walled tubes, serving as springs. Kingsdown says they are "coil-shaped," so there must be a helical aspect which does not show in the illustration. They behave the way pocket coils do, with each coil responding independently from its neighbors. The individual action of each Q-Coil conforms to body contours for the purpose of relieving pressure on places such as the hips and shoulders while supporting recessed areas such as the lower back. Omalon® is also a product of Carpenter. The stucture of the cells in Omalon is different than that in conventional foams. The primary stated beneft of this structure is increased durability. Carpenter says that it "is guaranteed to last for life." 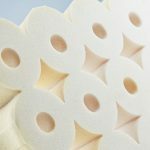 Kingsdown describes the Omalon Foam Coils as "designed for lasting support and pressure relief." This foam has an "innerspring design" as shown in the cutaway view*. The technology of the foam construction, described as "innovative," allows these foam coils to function as springs. *The model used in the cutaway illustration is the Umbriel. The bottom layer of the Kingsdown Elliptica is the interlocking Progressive Core made of high-density foam. 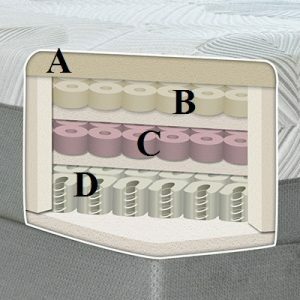 This is the underlying support for the whole mattress. 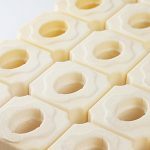 Coupled with foam sidewalls and the top layer, this keeps the foam springs in place, providing stability. 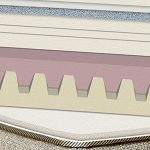 It is also interlocking and allows the bi-directional flow of air for keeping the mattress cool and dry. 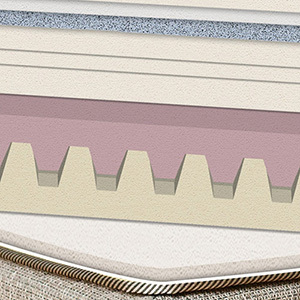 There are also dividers between the foam coil layers in the mattresses of this collection. Among other materials in an Elliptica Collection mattress is memory foam infused with gel. 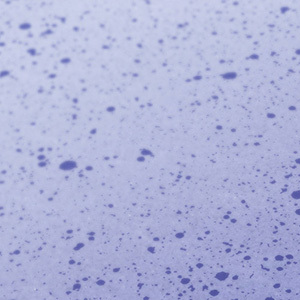 The gel is to enhance the support of the conforming memory foam. It is also used for cooling. Available through Kingsdown's retail partners, mattresses in the Elliptica Collection are covered by a 10-year warranty.